June 4, 2017 — The Social Innovation and Entrepreneurship Development Fund (SIE Fund) engaged St. James’ Settlement last year to be an intermediary to take forward SIE Fund’s first flagship project on food support services. In May 2017, St. James’ Settlement launched FOOD-CO, the first all-round food support collaborative platform in Hong Kong. Through the use of technology and data analysis, the FOOD-CO platform aims to enhance the efficiency and effectiveness of food support services in Hong Kong. FOOD-CO is open to food support service operators and food-donating companies for sharing information on the demand and supply of food items and related services, thus enabling a more effective and efficient matching of food donations and food sharing. It also provides a platform for food support service operators to share best practices. Members of the public and people who need food support services can use the FOOD-CO App to locate food support service points and find out the service details. FOOD-CO will also engage the public in various activities to raise public awareness of food support services and promote the spirit of “Save and Share”. FOOD-CO was rolled out for trial in Kwai Tsing, Kwun Tong and Yuen Long in May 2017. It is expected that the platform will extend to cover all 18 districts of Hong Kong by phases starting from 2018. The targets are to increase the number of hot meals and packaged food items by 50% to 50 000 per day and the number of beneficiaries by 30% to 20 000 persons by the end of 2019, manifesting the spirit of sharing. “Food support is a key area of concern of the SIE Fund. The SIE Fund Task Force is of the view that a greater impact can be achieved by extensive collaboration through a flagship project. Last year, we engaged St. James’ Settlement to be our intermediary to take forward the food support flagship project which aims to enhance the efficiency and effectiveness of food support services in Hong Kong. In the past year, St. James’ Settlement has met various stakeholders to collect their views and completed a baseline study on the existing food support services. And in May this year, the FOOD-CO platform was successfully launched,” Professor Stephen CHEUNG Yan-leung, Chairperson of SIE Fund Task Force, said. Every day, 3 000 tonnes of food waste is disposed of in Hong Kong. Yet, many low-income people are in need of food support services. 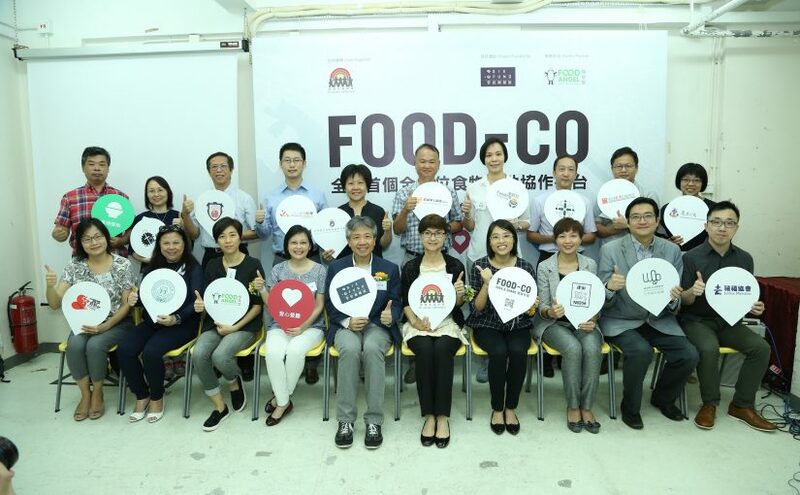 In August 2016, FOOD-CO commissioned the research institution Policy 21 to conduct a baseline study on the supply and demand of food support services as well as the state of food recycling in Hong Kong. According to the study, there are currently 161 service points of direct food distribution which are spread across Hong Kong, and that 33 000 sets of meal and packaged food are provided to 15 000 persons each day. Yet not all service points can adequately meet the demand in their respective districts, whereas the number of meals and packaged food is no match for the huge demand. According to the baseline study mentioned above, more than 72% of food support service points indicated that they encountered different operational problems. For instance, more than half of them said they lacked operating funds and more than one-third pointed out insufficient support in logistics. While facilitating information sharing, FOOD-CO also helps food support service points secure manpower support by mobilising volunteers. In addition, it will hold experience-sharing sessions for donors and service providers with a view to increasing the efficiency and efficacy of the services. “Ever since St. James’ Settlement started our food bank in 2003, we have been working with different NGOs, donors and supporters to provide assistance to people in need. FOOD-CO marks an important step forward for the food support service sector as it will consolidate the strengths of different parties and enable us to share knowledge and allocate resources more effectively. The platform will spread the message of ‘Save & Share’ across Hong Kong and increase support for the underprivileged,” said Mrs Cynthia LUK, Chief Executive Officer of St. James’ Settlement. “Nestle’s purpose is contributing to a healthier future and Creating Shared Value is one of the fundamental guiding principles for how we do business. Guided by this vision, Nestle Hong Kong has been actively contributing to the society while expanding our business. We are delighted to participate in the Food-Co Programme which is indeed a very meaningful programme. We hope it can be supported by all walks of the society, making food donations and sharing to be more effective,” said Miss Garce HO, General Manager of Nestle Hong Kong Limited, which is a partner of FOOD-CO. For food support service points that are relatively small in size, FOOD-CO can help them gain access to a wider source of food. The Liaison Officer Mr King-leung CHIU of Dacars Enchi Lodge indicated that the FOOD-CO mobile app was very convenient to use. It helped expedite their food collection process and facilitate their easier reach-out to donors, eventually increasing their chances of receiving food donations and expanding their source of food. FOOD-CO is now calling on corporations and food support service providers to download the FOOD-CO mobile app and participate in the platform. Members of the public can make use of the “Food Sharing Map” to locate food support service points in different districts. For details, please visit https://food-co.hk/main/en or call 21175855.